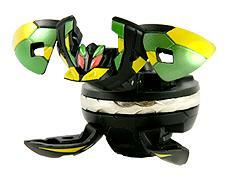 Ziperator is a special evolution Bakugan. It is a spinning Bakugan by using ripcord, which might mean it's part of the BakuZoon series. It was first shown at The 2010 World Toy Fair. It looks like a Heavy Metal Bakugan. The metal band that runs along its body spins when you pull the rip cord out. It has been misnamed as Zipzam in the anime. It is a Special Evolution Bakugan. It can evolve from any core Bakugan. Purchase your Ziperator Bakugan from Amazon now!